As we approach the Winter Solstice, when the longest darkest night of the year turns over to the expanding light that will follow, Temperance calls us out of the dark depths of our feelings and into the light of hope. The Temperance/Sagittarius Tarot card therefore naturally follows the Death/Scorpio card. This 14th Major Arcana, often featuring an angel and a rainbow, welcomes us into the light, after an emotional storm or death, and promises hope, healings, blessings, and miracles. When you look to the bright side of every challenging situation, you invoke a more positive reality going forward. Images of water and fire are often reflected in this Major Arcana. It is important to recognize that too much fire/passion can steam up the water and cause one to lose sight of what is truly meaningful and deep at heart. As a correlate, too much water can put out the fire that keeps one warm, full of life, and in good cheer. 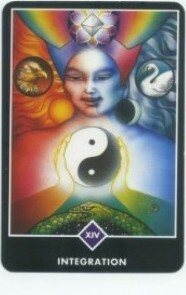 Temperance reminds us to maintain a perfect alchemy, balance or integration between the two elements. In my many years of experience giving readings, I have found this card to be the most representative of harmony in relationships (more than The Lovers which is really more about the balance and integration of male and female qualities within the self). Temperance shows us that we need both the elements of water and fire equally to stay in love or connected in relationship. Like the yin/yang featured in the Osho Zen version of Temperance featured here, the balance between light and dark, male and female, fire and water is essential to becoming whole. One cannot exist without the other. There needs to be equal energetic exchange between the two elements or between two people in a relationship. We need water/yin/female/depth to support and nurture our emotional well-beings (given we humans are 70% water just as Mother Earth is 70% water). Equally we need fire/yang/male/light to stimulate the creative growth, passion, adventure, fun, and strength of our relationships. No doubt we could not exist without our Sun. If you are having trouble staying optimistic in such turbulent and difficult times, seek someone with a good dose of Sagittarian energy to uplift you. 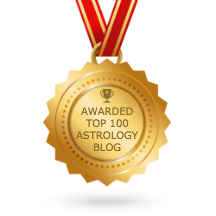 See Genevieve’s blogs on Sagittarius to get a sense of what wisdom, humor, and positive outlooks they may offer you. Temperance/Sagittarius teaches us that humor can be an essential antidote to the winter blues or any sort of blues for that matter. We may look to the benefits of Hasyayoga (Laughter Yoga), developed by an Indian physician Madan Kataria, to stimulate laughter through yoga breathing and sound. The practice of Hasyayoga gets the blood flowing and generates more oxygen for the body and the brain. Laughter yoga is based on the assumption that the body cannot differentiate between contrived and genuine laughter, and that the physiological and psychological benefits are the same. So go on and have a giggle! Laughing at our mistakes, weaknesses, and in the midst of hard times can shift us into more joy and blessings. Temperance blesses us with the gift of life, and calls us to celebrate all that we are becoming and sharing with one another.